You mentioned that Titan has fewer impact craters than would be expected. Does this mean that a moon or a planet which has a lot of impact craters such as earth’s moon Mercury Mars etc. is therefore old? I would suggest that the reason for the few craters is Saturn, which with its much higher gravity, would draw the various comets meteors etc away from Titan. In answer to your question, no it does not. This would be committing the fallacy of denying the antecedent, as explained in Logic and Creation. The explanation for lots of craters on the moon is a brief intense swarm of meteoroids, travelling on parallel paths, probably during the Flood year. This is supported by ghost craters, evidence of rapid succession of impacts, and by the fact that 11 of the 12 maria are in one quadrant, evidence that the major impacts occurred before the moon had even moved far enough in one orbit (month) to show a different face to the swarm. See On the origin of lunar maria and A biblically-based cratering theory. The alternative is that the crater calibration stuff is off, and radiometric dating is wrong. So, the Moon is not 4 billion years old, it’s 6000 years old. With the crater population of Titan, that means Titan can only be, oh, around 15-150 years old. Except that it was discovered in 1655. Or, the entire crater calibration stuff is completely wrong. Which means you can’t use it to say Titan’s surface is young, which is what he is claiming — that it is young because scientists are showing it’s young because it has few craters. I left that out because it’s really a form of my second alternative: The crater calibration techniques are bogus, you can’t use them. By Jonathan Sarfati claiming that the lunar cratering is unique and special, it means that the cratering calibration is way off because cratering chronology is BASED on the Moon. And, if it’s off, if we don’t know how to calibrate any ages with craters, then you can’t possibly use them to say Titan’s surface is young or old, which is the basis of the claim that the CMI article is based on. So again, this doesn’t solve the problem, it introduces more problems and shows yet again that the young-Earth creation model is internally inconsistent. You can be a young-Earth creationist and claim Titan is young (you’ll be wrong, but you can claim it). Just don’t use the crater chronology to do it. If you do, you’ll wind up going in circles as I’ve demonstrated in this and the previous post. Why? Because it’s inherently inconsistent to do so. If the consequence of a CONSISTENT crater chronology were that Titan’s surface was <6000 years old, then that would be the mainstream science thinking on the subject. It's not. Because the crater chronology doesn't show it, if you use a consistent chronology across solar system bodies. I’m always amazed at the penchant for young-Earth creationists (YECs) to use science for part of their argument and creationism for another part, when it relies on the science being right, but they’re arguing that the science is wrong. The basic idea behind using craters to estimate the age of a surface is that, if you have an older surface, it’s been around longer and has had more time to accumulate more craters. So, more craters = older. We can use samples from the Moon to correlate crater densities with absolute ages and get a model for how many craters of a certain size equals a certain age. That’s the basics … if you want more, see my podcast, episodes 40 and 41: Crater Age Dating Explained, Part 1 and Crater Age Dating and Young-Earth Creationism, Part 2. So, we have, from the moon, the idea that a heavily cratered surface equates to one that’s been around for billions of years. This REQUIRES radiometric dating to be correct and the basics of crater age-modeling to be correct. The implication is that a surface that has just a few craters is much younger. Titan is Saturn’s largest moon, its atmosphere is thicker than Earth’s, and the Cassini and Huygens probes have shown that its surface is geologically active. It also has very few impact craters. In his article, he is keying in on a recent popular article that explains that Titan’s surface looks young, and there are a few ways that it can still be geologically active (as in have a young surface, like Earth) and still have formed over 4 billion years ago. 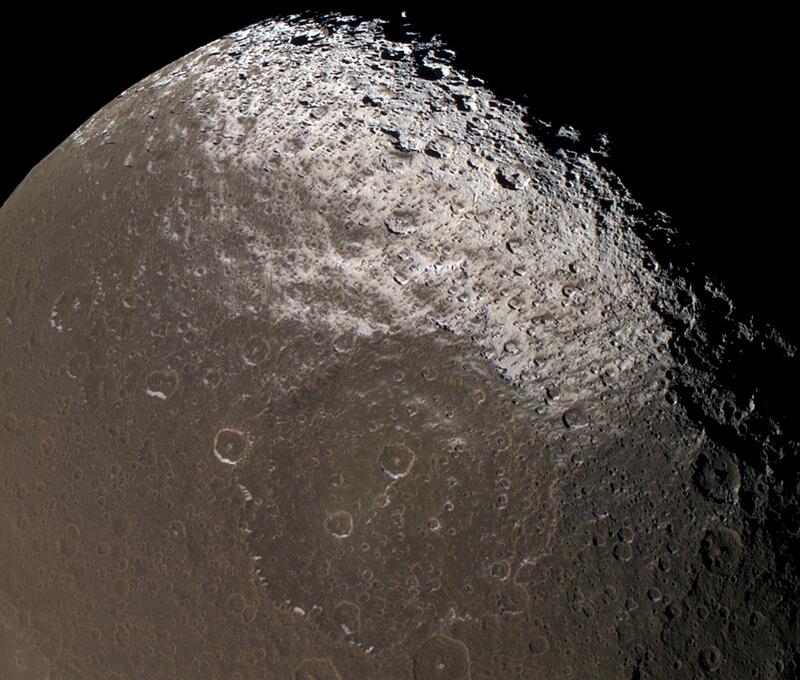 The problem is that, for us to say it looks young, that’s because of the few impact craters. Versus old, that’s because of radiometric dating and then the calibration to lots of impact craters on the Moon. For Coppedge to say (effectively) “Yes, scientists are right, Titan’s surface looks young because it has few impact craters,” then he is REQUIRED to accept the basics of the crater chronology system, which he clearly doesn’t. 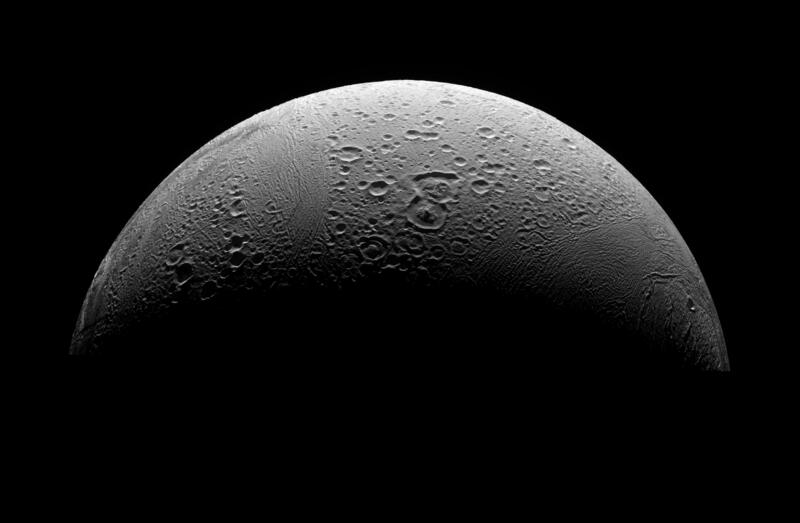 Because, if Titan is young because it has few craters as he is agreeing with, then the Moon and other bodies must be much older under that same crater chronology system. Yes, confusing. To get to point B, he must accept A. He thinks B is true, but he does not think A is true. Hence the confusing cognitive dissonance he just ignores. Does anyone have a headache now? I think I gave myself one. I’ve been doing some research on and off for this episode for quite awhile and finally had enough to post it: Episode 90: “Investigation into Billy Meier’s Alleged Foreknowledge About Stuff About Jupiter and Saturn.” The shownotes for this episode are extensive with lots of references. It’s been scheduled as Episode 90 for about two months. I decided to do it because I found it an interesting scavenger hunt, despite the fact that UFO-related posts are among my least-read blog posts. The blog entry I reference towards the end of the episode is from January: “How Astronomers Are, According to Popular Press, Constantly Discovering the Same Thing.” I recommend looking through it because it’s a good example that has nothing to do with the Meier case where even peer-reviewed, professional science papers will sometimes ignore work that has shown the same “new” thing before, and it’s a good example of how press releases can play up various “discoveries” … even if they’ve been made before. The podcast episode also has a few notes at the end, and there’s some feedback clarifying the discussion about why oxygen isotopes are important for understanding where objects formed in the solar system. Given what’s happened in the past when I’ve talked about Meier’s material, I’m going to reiterate my comments policy: Comments need to be on-topic, and I make the final decision of what comes through; I do not owe you an explanation if your comment is not posted, my comments policy is pretty clear. Any comment to this post needs to be specifically about this podcast episode. If you’re going to dispute material in it, you need to provide specific references and be specific about what you are disputing. You need to be succinct. That means no lengthy essays. That means no posts with numerous links to random stuff. That means no links to videos about trees — no embedded videos period, I will remove them and I will remove posts that are simply a bunch of random links to Meier material, especially if they do not support the specific thing you are refuting / referencing. That means not debating whether trees in a video are real or models. This episode is specifically about certain claims about Jupiter and Saturn, whether those claims/statements were true, and whether it was known or openly speculated before Meier’s writing that they were true or existed, which is what the claim is for Meier’s prophecy: “… with literally dozens of other such documented examples of Meier’s having published specific, accurate information years, and even decades, before terrestrial scientists, the case must be recognized as being authentic based on these irrefutable facts alone.” It is not the claim that this stuff was known on Earth but Meier didn’t have access to that information so he still got it from ETs — and if that’s what is going to be claimed now, then that is an unfalsifiable and unverifiable claim and is moving the goalpost. What Happens When All the Planets Line Up Against Us? In this equation, F is the force felt, G is the Gravitational Constant, M m are masses of the two objects in question, and r is the distance that separates them. To figure out how much more or less two different objects will pull on the same object, we can simply remove one of the two masses, so the equation simplifies to F = G * m / r2. To determine the relative forces, one simply needs to know the mass of the planets and sun, and the distances between Earth and those objects. This can be found in any basic astronomy textbook or online source. One then can simply plug in the numbers and figure out the forces. This is a really short post because it doesn’t need to be long. To be perfectly honest, I was actually surprised at how small the force of Jupiter actually is on Earth relative to the sun. If we add up the force from all of the other objects, we only get a force that is 0.566% as strong as the sun’s. And then if we take the moon out of the equation because that would be the first to move out of the alignment, then we have a force of only 0.000592% as strong as the sun’s. If we look at Venus if it were also lined up, helping the sun, its force is 1.90·10-7, or about half as much as all the other planets (again, leaving out the moon), so it would cancel 54% of the effect of all those other objects (again leaving out the moon). The force from Mercury is only about 1/3 that of Mars. So really, if anyone who makes this claim were to bother to spend about 10 minutes looking up the numbers and plugging them into an Excel equation (what I did), they would quickly see that this claim is simply and utterly nonsense. And this is besides the fact that the planets aren’t lining up any time soon on the other side of Earth to try to pull us out of orbit. Several months ago, I posted on a young-Earth Creationism (YEC) article about uranium-238 radiometric dating of the solar system. In that article, I stated that I had one of my numerous psychic premonitions when I read the original science article that the creationists would use it somehow. But, I had no documentation backing that premonition up so I can’t apply for the James Randi Educational Foundation’s $1 Million prize. Darn. In a much earlier post, nearly a year ago, I wrote a post on more YEC claims that the Saturnian system is young. I mentioned that they were indirectly using my own research in their claims. Now, a year later, the science journal Icarus has its April special “Cassini at Saturn” edition out, and I happen to have a first-author paper in it. In addition, on Friday, the March 19, 2010 issue of the very prestigious journal Science has a 5-page article that kinda summarizes several of the papers in Icarus – including citing mine – that show that Saturn’s rings aren’t just boring slabs of particles orbiting away. Call me “psychic,” but I have a feeling that some YECs will be using this in another of their attempts to propagate their version of a literal biblical worldview. This post is an attempt to summarize my own research on the rings and to show why the dynamics that we see are fully consistent with an old ring system. Warning: This blog post rambles a bit more than usual. In it, I outline how models are created in astronomy, how that applies to the mass of Saturn’s rings, how the mass is linked to the age of the rings, and then my own research into the mass and hence age. It’s really a background post so that if/when the YECs pick up on this story I can just refer to it for background and just address the claims on that post. The entire purpose of physics is to mathematically produce a model that replicates the observable world. When a scientist starts out to create a model of a complicated system – say, Saturn’s rings – they will start with the simplest model possible and then add layers onto it in complexity. Very early on, the rings were thought to be solid – thin disks that orbited Saturn. Later, that view changed to one where individual particles were thought to make up the rings. That’s the view we hold today. In terms of the dynamics involved, in modeling the rings, one starts with a bunch of particles in orbit around a large central mass (the planet), and uses basic physics to describe how they would interact with each other. By adjusting parameters such as how big the particles are, how many there are, etc., you will get different results, and you can use the observable data to then constrain your model. Some basic parameters that are still somewhat unknown about Saturn’s rings are the makeup of individual particles, their density, how “sticky” they are, how large they are, and how much material is actually there. Around the time I was born, the starship Voyager spacecraft (1 and 2) passed by Saturn. One of the many observations they made is called a “stellar occultation” through the rings. An “occultation” is when you block out a background object with a foreground one. In this case, a “stellar occultation” is when a star is blocked out, and this was by Saturn’s rings. The purpose was to measure how much light got through the rings in order to measure their “optical depth.” “Optical depth” is, well, how much light can get through something. An optical depth of 0 means that everything gets through. Anyway, based on the Voyager measurements, which showed significant optical structure in the light that got through the rings, we had to complicate our models. And by “we” and “our” I mean the ring-studying community … I hadn’t quite entered kindergarden. The rings were still modeled as particles, but they were modeled like “granola bars” (in what is referred to as a “granola bar model”): Slabs of optically thick (no light gets through) clumps/aggregates of ring particles separated by optically thin (light gets through) gaps. In developing their models, the question now focussed on the width of those slabs and the width of the gaps between them. It was from these models that values are still quoted today in terms of the height of the rings (“several yards” – though some places say “less than a mile”), the mass of the ring system (around the mass of the moon Mimas), and perhaps most importantly for this discussion, the age of the ring system. There’s a principle in astronomy that states, “We do not live in a unique time nor place until shown otherwise.” I’m not going to argue here whether that’s a good principle to live by and do research by, what its roots are, nor its “validity.” Regardless, it’s there and I personally think it’s fairly good to stick with for the time being because it forces us to do more work. What came out of the Voyager results is that the ring system seemed “young.” “Young” here is in quotes because it means something on the order of 100 million years. That’s only 2.5% the age of the solar system, hence “young.” Part of the reason for this is that the “dynamical lifetime” of the rings of that mass is much less than the age of the solar system — the ring particles are slowly raining down on Saturn and in the future the ring system will be gone. But, that unsettles astronomers because of this principle that we don’t live in a unique time nor place. It also makes different formation mechanisms much more difficult to justify statistically. In other words, it is much easier to justify, for example, two moons crashing together – or a moon and a large asteroid or comet crashing together – during the solar system’s formation or very soon afterwards when we know those kinds of collisions were common than it is to justify that happening recently, when the solar system is fairly well behaved. Cassini is a craft that’s been in orbit around Saturn since 2004. Besides many truly awe-inspiring pictures it’s taken, an instrument on it also performs stellar occultation measurements through Saturn’s rings. Over the course of nearly 6 years and well over 100 such observations, we have a much more detailed understanding of the optical thickness of the rings — how difficult it is for light to get through any given location in the rings as a distance from Saturn. For my research, I performed what are called N-body simulations, where in the computer I created a mini saturnian ring section. I varied many different properties – including the ones I mentioned a few paragraphs ago – and I let the system evolve from an initially random state. I then simulated a Cassini observation through my little ring section. I then compared the results of my simulated occultation to the real ones. From these results, I was able to further narrow-down some of the basic, fundamental properties of the rings. The most important one was that I was able to place a new, minimum mass constraint on the total mass of the ring system. 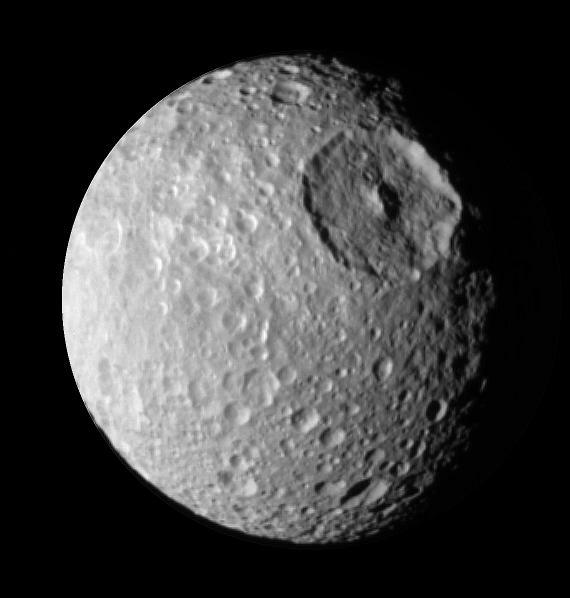 This new constraint is about twice as large as the original one – about 2 times the mass of Saturn’s moon Mimas. How Does Mass Relate to Age? Directly, it doesn’t. But indirectly, it does, and I’ll explain here two examples of why. One is the example that I explained above — if you have more material, then the dynamical lifetime is longer, and you can make the rings correspondingly older by the simple fact that they are still there today to be observed. A second reason why is that of pollution. As the ring particles orbit Saturn, micrometeorite impactors rain down on the rings and will pollute them. Through various observations and modeling constraints (including mine), we know that the rings are more than 90% water-ice. This is really pure ice and raises the question of how something so old could be so fresh, especially with the pollution from other material. The answer lies at least partially with the mass: If you have more material there to begin with, then you can more easily “hide” the pollution. For example, if a factory spits out sewage into a small lake, then after a day that lake will look pretty gross. But if that factory spits out the sewage into the ocean, it can do it for many, many years before the ocean is going to show any signs of being polluted. The same is true with the rings. I don’t actually expect YECs to directly respond to my paper in particular. I think it approaches the problem too indirectly for them to take notice and think it’s worth writing about. (1) Creationists will somehow try to link this to “darwinism” and that an old ring system “belief” is driven by some desire to provide “millions of years” for evolution to occur. (3) I expect the creationists will key in on the dynamical nature of the rings that we see today. This is not something that I talked about in this post much at all. Very briefly, it has to do with moving from the “granola bar model” to self-gravity wakes of material clumps that we have observed in simulations, theory, and observations that move around, exchange material, and produce bumps, ridges, spokes, and cusps in the rings that Cassini observes. If they do happen to address this, then I’ll discuss it more in my response post. There you have it. I have a prediction out there. I’ve preemptively discussed my own research in this area and hopefully explained it in a reasonably clear way. Now let’s see if the YECs bite.